The happy bee’s social media accounts posted its newest offerings--Halo-Halo Sundae and Adobo Flakes two days ago and the Jollibee foodie community went crazy! 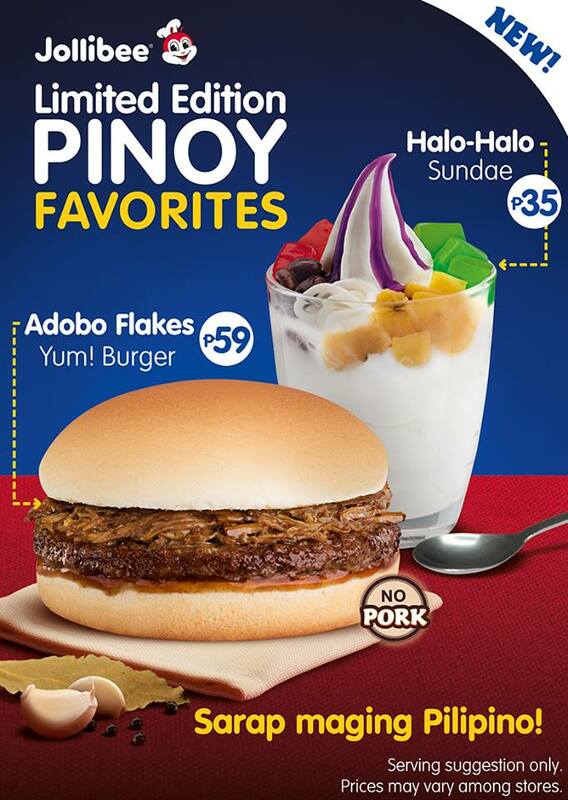 It all started when my college friend B posted a photo of Jollibee’s Adobo Flakes “no pork” burger and Halo-Halo sundae at 11 pm. I quickly shared the post with R and as usual, my giddiness died down when R didn’t find it interesting. The case is totally different though with my looloo friends. Food excites them (and anything matcha turns most of them wild). R2 and looloo Community Ambassador J were the first ones to try the new offerings and said that it was good. Not exactly superb or drool worthy but not bad for the price you pay. I wanted to head to Jollibee after work yesterday to try it but R’s dad wanted to eat out and so I had to head home right after as they’ll pick me up at my place. But I finally got to try it earlier for lunch. As for the taste, it was simply vanilla sundae with halo-halo toppings. Nothing more, nothing less. They scrimped on the toppings as I only got 4 jellies, roughly 6 beans and 4 coconut strings. I also had about 1 cm of langka. And I’m not even exaggerating here. Then again, it was a nice treat to help you cool down. Just don’t expect too much.